The study included 8 adults diagnosed with MS who had difficulties with balance or gait. The following article is part of conference coverage from the 2018 Annual Meeting of the Consortium of Multiple Sclerosis Centers in Nashville, Tennesssee. Neurology Advisor’s staff will be reporting breaking news associated with research conducted by leading experts in neurology. Check back for the latest news from CMSC 2018. 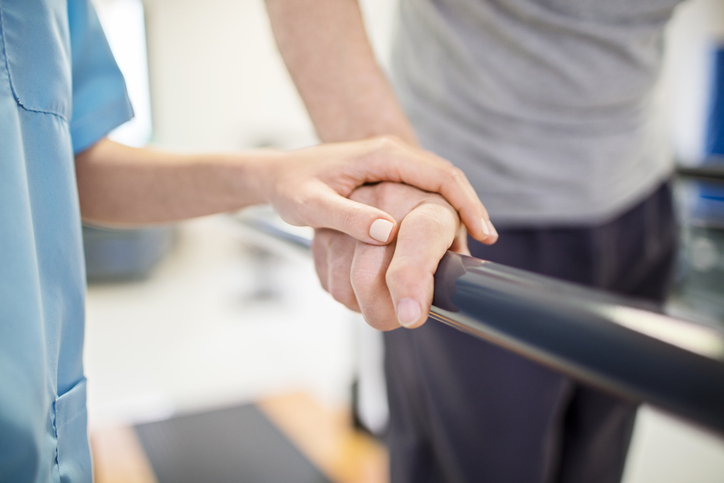 A combination of dalfampridine extended-release and physical therapy (PT) has shown efficacy for improving gait in people with multiple sclerosis (MS), though it is unclear whether PT enhances dalfampridine’s effects. This research was presented at the 32nd Annual Meeting of the Consortium of Multiple Sclerosis Centers, held May 30-June 2, 2018, in Nashville, Tennessee. The study included 8 adults diagnosed with MS who had difficulties with balance or gait. Half were not given dalfampridine, and the other half had recently been prescribed dalfampridine. Both groups received evaluations at the same times: once before the dalfampridine group began taking the medication (week 0), and once more to evaluate the response (week 3). At the 3-week mark, all 8 subjects began a PT regimen that occurred twice weekly for 6 weeks and included exercises for gait, balance, dual-task training, and improving functional strength. Those in the dalfampridine group continued taking dalfampridine while performing PT. The study researchers reassessed outcomes at weeks 9 and 12, with the primary outcome being a timed 25-foot walk at fast gait and secondary outcomes being balance self-efficacy, dual-task gait, and self-selected gait. By week 3, those in the dalfampridine group showed an average of just 12.8% (range, 5.8% to 19.4%) improvement in timed 25-foot walk. However, weeks 3 to 9 showed a 20.7% improvement in timed 25-foot walk for the dalfampridine+PT group (95% CI, 3.8-37.6), as compared with 6.8% for the PT only group (95% CI, 3.4-10.3). The dalfampridine+PT group showed a significantly greater improvement (P =.04). From weeks 0 to 9, the dalfampridine+PT group showed a mean increase of 30.5% (range, 20.5%-48.9%), thereby passing the responder threshold of 20%. This group also showed improvement in dual-task and self-selected gait of +0.11 m/s and +0.15 m/s, respectively, between weeks 3 and 9. There were no significant improvements in the PT only group or between-group from weeks 3 to 9. The dalfampridine+PT group showed a significant increase in balance confidence (P =.003). Plummer P, Huryta WW, Reynolds JH, Markovic-Plese S, Giesser B. Dalfampridine may enhance the effects of physical therapy on gait in people with multiple sclerosis. Presented at: 2018 CMSC Annual Meeting. May 30-June 2, 2018; Nashville, TN. Abstract RH25. For more coverage of CMSC 2018, click here.